E3 2015 was an amazing event and featured massive reveals, stunning tech demonstrations, and a slew of surprising, and occasionally odd, celebrity appearances. And somehow, even after a demonstration of Microsoft’s Hololens, gameplay footage of Halo 5, Gears 4, The Last Guardian, and a good number of new IPs, Final Fantasy still managed to steal the show. E3 2015, and 2015 in general, have proved one simple fact: Final Fantasy, everyone’s favorite JRPG franchise, is making a huge comeback after being beat down and left in the gutters for years. Having been a Final Fantasy fan since my earliest gaming days, I can confidently say that never in the history of gaming has there been a better time to be a fan of the long-running series, nor has there been a better time to get into the series if you never have played any of the games before. For the first time in years, you can go into a gaming retailer and see multiple Final Fantasy games on the shelves, with even more on the way. So if you’re looking for a reason to start playing some FF titles, or maybe get back into the series, I’ve got ten reasons for you right here. I have been pleasantly surprised by how much I enjoy this game, now available for iOS and Android devices. Record Keeper takes the player through the halls of Final Fantasy history, where records are kept of the series’s most pivotal moments. Half fan-service and half celebration of history, it lets players experience moments like the Opera House from FFVI, and Aerith’s death from FFVII, unlocking new characters while doing so. Record Keeper is primarily made for long running fans of the series. So, if you’re like me and have played all or most of the main Final Fantasy games, make sure to check out Record Keeper, available now for free on the App Store or Google Play Store. Most dedicated Final Fantasy fans either know of, or have attended, a Distant Worlds concert. For the uninitiated, Distant Worlds is a live symphony orchestra that plays various songs from the FF series. I had the chance to attend a New World concert, which is a smaller and more intimate version of Distant Worlds, and it was an amazing experience. But even more epic than Distant Worlds or New World is Final Symphony, a partner project between Nobuo Uematsu and other Final Fantasy composers, and the London Symphony Orchestra. Songs from the series are arranged into beautiful and epic suites and rhapsodies that tell the entire story of each game, using only music. The first Final Symphony album was released earlier this year, and contained music from Final Fantasy VI, VII, and X. in September, the live performance of Final Symphony II will begin, and will feature music from Final Fantasy V, VIII, IX, and XIII. If you like good music, you’ll like Final Symphony. And if you don’t like good music, you’ll probably still like Final Symphony because its just that good. If you need even more evidence that Square Enix is trying to make things better for their fans by giving us what we want, Type-0 is another great example. Type-0 (and that’s a zero, not a letter O, otherwise the title sounds like a game about diabetic vampires) was released for the PSP in Japan a few years ago, and ever since North American fans have been bugging Square Enix for a local version of the game. Square answered the call and delivered this remastered version of the game for current-gen consoles. While Type-0 is a far cry (video game pun) from the greatness of some of the series’s main games, it is an interesting title considering its heavy usage of the Fabula Nova Crystallis mythos established in FFXIII. 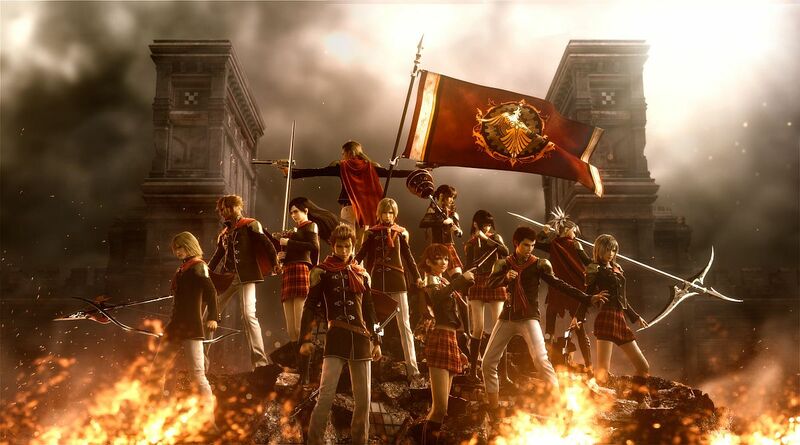 With a huge cast of playable characters, each one unique and interesting, Type-0 never gets boring and is a fun ride, especially for fans of the series and for those looking for a fast paced, more action oriented RPG game. You can read my full review of the game here, or watch the review here. Final Fantasy X and X-2 were just released for the PS4 with graphical upgrades and slight modifications from the PS3 and PS Vita editions that were released last year. FFX/X-2 have never looked better, and it has been so great to revisit the world of Spira and experience what is arguably the most emotional and in-depth story of the franchise. FFX/X-2 HD, along with other releases, is a shining example that Square Enix is taking steps to correct mistakes made in the past, namely not listening to their fans. Some may say that this release is unnecessary, but for PS4 owners who are fans of the series, FFX/X-2 HD is a must-have. For more information on the most recent Final Fantasy release, you can check out my review of the game here. We still have no idea how far along FFXV is, and when it will be released. But a few things are certain, thanks to the four hour demo that came with copies of Type-0. First off, the combat is a brand new, action-heavy style never before seen in a Final Fantasy title. It relies heavily upon quick thinking, even quicker reflexes, and timing. Most importantly, timing. Also, timing. I can’t really stress that enough. Even in the demo, the game already looks gorgeous, and the eclectic cast of characters may be able to provide a solid story and a fun time. It was stated previously that Square Enix would not even consider remaking FFVII until they had produced another FF title that was as universally loved. And, considering the fact that the remake is happening, this could be a sign that points to the quality of game that we can expect from FFXV. One of Square Enix’s announcements at E3 2015 which may have been lost in the flurry of new announcements, trailers, and gameplay footage was the creation of a new sub-studio called Tokyo RPG Factory. Details were sparse, but the studio is already working on a brand new RPG title referred to as Project Setsuna. While an entire portion of Square Enix being solely dedicated to the creation of RPGs is exciting enough, perhaps this will have an effect on the Final Fantasy series as well. It isn’t clear at this point exactly what the RPG Factory will be focusing on, whether it’s Final Fantasy, new, or lesser known titles like Star Ocean. But either way, the mere existence of the Tokyo RPG Factory signifies that a more purposeful effort will be executed when creating RPGs, and should allow more resources to be allotted to the creation of upcoming FF games, whether they are created within or without the RPG Factory. E3 2015 was extremely generous to Final Fantasy fans, and the announcement of World of Final Fantasy just serves as extra excitement fodder. We aren’t really sure what the game is, but it will focus on two siblings and their journey, presumably through the world, or worlds, of Final Fantasy. They change from full size avatars to cute little chibi characters, and the game will likely be filled with gratuitous fan service, not unlike last year’s Hyrule Warriors did for Zelda fans. The most exciting part about this game may be not just the character nostalgia, but the gameplay nostalgia. Hiroki Chiba, the director of the game told about the combat style we can expect to see. “The playstyle is like Final Fantasy games before Final Fantasy X, so it’s more geared towards an RPG style game…Players will be able to input commands or go for a more retro-esque Final Fantasy command system during battles. I want to keep that Final Fantasy feel of previous titles, so there will be random encounter battles but also story-based battles where you will have to fight them to progress the story.” Sounds freaking brilliant to me. A few years ago, the strangely titled Bravely Default was released for the Nintendo 3DS. Given the current state of Nintendo and Square Enix’s relationship, it’s surprising that the 3DS was chosen for this release over the Vita, but I’m not complaining. Bravely Default is a Final Fantasy game in everything but its name. It features turn based combat that dates back to even before Final Fantasy IV. Yes, that means it doesn’t even have an ATB gauge. But what it does have is customizable job classes, summons, phoenix downs, beautiful hand-drawn backdrops, and the best looking 3D to date. If you haven’t played Bravely Default yet, don’t miss out on a stellar game. Bravely Second, the sequel to the 2013 game, has already been released in Japan and has received near perfect scores from reviewers. Gamers outside of Japan can expect to see Bravely Second hit shelves sometime in 2016. Hopefully early 2016, because I’m dying to play it. While not an official Final Fantasy game, Kingdom Hearts has all the trappings of one. Actually, considering the number of FF characters who appear in the games, it probably is an official game. We finally got to see some awesome gameplay footage of Kingdom Hearts III at E3, and the best thing about what we saw? It looks like Kingdom Hearts. It looks bright, fresh, fast paced, and most of all, fun! While we still don’t even have a release window yet (why??? ), the game looks like it’s coming along nicely. Assuming you can handle Sora’s altered and aged appearance, Kingdom Hearts III set to meet all expectations. Watch that trailer, then weep tears of joy for a bit, then continue reading. You can’t really say enough about this incredible announcement, so I’ll keep it brief. Finally, 18 years after its original release, FFVII is getting a full HD overhaul and remake. Amazing. But what’s even more amazing than that? We’re still getting even more FFVII content! The PC version of FFVII is still coming to PS4 (and maybe Vita? Maybe? Please? ), as announced last December. It will take until winter to get here, but will be worth the wait. But not only will it be coming to PS4 (and again, I can’t stress this enough, Vita please), it will also be developed into a mobile game for Apple, and presumably Android, devices. That brings a whole new meaning to the term “iCloud.” But seriously, imagine FFVII on the go, just a few taps away at any moment. First world blessings, folks. Which Final Fantasy release are you most excited for, or have played the most this year? What do you want to see as part of the FFVII remake? Make sure to educate us on all things Final Fantasy in the comments!